Thank god for weekends though! I had another great one filled with plenty of runs. On Saturday, I decided to do another tempo run. In the past, I never really focused on hitting a certain pace during my half marathon training and just relied on race day adrenaline to make me faster. Coming off the 5k series this summer though, I feel like my speed is right where I want it to be and I’m not ready to lose it yet! 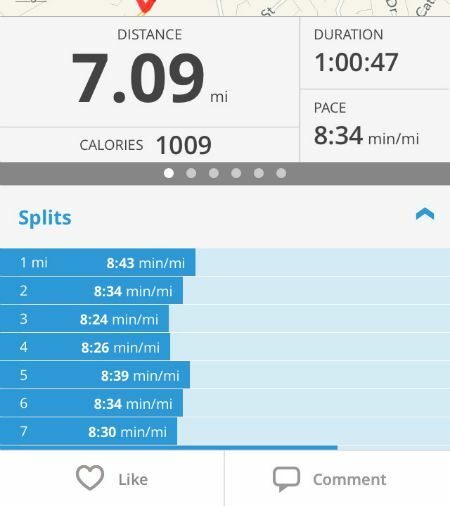 So with that in mind, I set out to push myself for a speedy 7 miler on Saturday. But I still have to survive the stress of moving first. On Sunday, I met up with my running club for the monthly brunch run, which featured a fun Oktoberfest theme (I’m not exactly sure why given that it’s still September, but I didn’t question it). We split up into groups for a shorter 3.5 mile loop and a more challenging 7-miler. There were way fewer people who opted for the 7 mile loop, but I figured if I had run that distance the day before at a speedy pace, that it wouldn’t be too hard. Plus, I wanted a semi-long run for my Sunday Runday. 🙂 It ended up being a pretty impressive challenge though because HOLY CRAP, STOP WITH THE ROLLING HILLS ALREADY!!! These hills made the hills on my 7-miler the day before look like little bunny hills. Our average pace ended up being 9:25/mile (last mile at 8:32!). All I can say is that I’m glad the half I’m running in a few weeks is completely flat. After we got back, I happily chowed down on a bagel and a little quiche while catching up with everyone. Overall a solid weekend of running, relaxing, and catching up on my Zzz’s. This entry was posted in Life, Training and tagged 2 Generations Running, Half Marathon Training, Tempo Run. Bookmark the permalink. Good luck with your move and your new running area. That IS a progression run, sister! Great job! Good luck with your move – I think you are going to run a sick race in October! Haha I have exactly the same feelings about hills. I do love them sometimes, but mostly I’m just like jesus christ gimme a break!